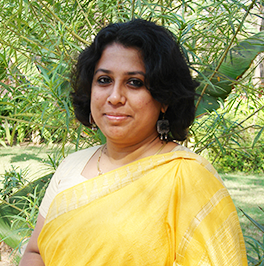 Pooja Susan Thomas specializes in Cultural Studies with a specific interest in urban culture. Her other research and teaching interests also include visual cultures, discourse analysis and critical theory. She has contributed her research to journals, books and refereed conferences. She has previously taught at St. Stephen's College and Kamala Nehru College, University of Delhi. She has a PhD from IIT Gandhinagar and M.Phil (with distinction) from University of Delhi. Her PhD work was on Ahmedabad and the discourse around its heritage. She took her B.A and M.A in Literature from St.Stephen's College, University of Delhi. She is UGC-NET qualified. While reading and writing are professional mainstays, Pooja also dabbles in some poetry, fiction and music. M.A and B.A (English Literature), St.Stephen’s College, University of Delhi, 2005. N.S Pradhan Memorial Prize, University of Delhi, 2006. Asha Kumari Prize, St. Stephen’s College, 2005. Shifts in the idea of cultural belonging in Ahmedabad through the prism of translation. Thomas, Pooja. “Viewing Bhadra: Of Pedestrian Vision in Ahmedabad's Global City Image.” Journal of Creative Communications 11, no. 1 (2016): 44-60. Thomas, Pooja. "Signifying Gandhi: Legitimizing Ahmedabad's Urban Future." Anekaant: A Journal of Polysemic Thought , vol 3, (2015): 35-42. Thomas, Pooja. "Writing Beyond the Nation: The Reveries of the Solitary Female Writer in the fiction of Charlotte Smith and letters of Helen Maria Williams.” In Anjana Sharma ed., Yearly Review: Revolutionary Aesthetics: Writing Nation/Embodying Gender,15(2007). Thomas, Pooja. "Translating Belonging in Ahmedabad: Representing Some Malayali Voices." In Rita Kothari ed., Multilingual Nation, New Delhi: OUP, 2018. Thomas, Pooja. "Translating Gujarati in Ahmedabad." In Rita Kothari ed., Multilingual Nation, New Delhi: OUP, 2016 Forthcoming. Thomas, Pooja. “Museum as Metaphor.” In Arvind Rajagopal and Anupama Rao eds., Media and Utopia: History, Imagination and Technology, by. London and New York: Routledge, 2016. Instructor and Facilitator. ''Discourse Analysis'' Short Course/Workshop at IIM Indore. 6-9 June 2016. Thomas, P. (2- 4 December 2014). Viewing Bhadra: Of Pedestrian Vision and the Pleasurable City. Second Biennial International Conference, Association for Critical Heritage Studies (ACHS). Canberra: Australian National University. Thomas, P. (17-19 July 2014). Of Uncertain Borders: Ahmedabad’s Sarkhej Roza. Asia in Motion: Heritage and Transformation. Singapore: Association for Asian Studies-in-Asia and National University of Singapore (AAS-NUS). Thomas, P. (17-19 November 2012). Museum as Metaphor: the Politics of an Imagined Ahmedabad. In XV International Conference, Forum on Contemporary Theory. Allahabad: Allahabad University.